The Victoria Jubilee Campaign has been successfully concluded. Bravo to the individuals who worked tirelessly to bring about this wonderful restoration project. The results speak for themselves. In honour of Queen Elizabeth II’s Diamond Jubilee, the restoration of the Victoria Jubilee Fountain was completed in 2012. Designed by J.W. Fiske & Co., the cast iron and zinc historic fountain’s protective coatings were failing and water corrosion had weakened the structures’ stability. The fountain’s decorative nymph and cherubs’ welded seams were splitting apart, there were cracks in the lower pool made worse by poor drainage, and there was a loss of pressure in the water flow. The project was completed under budget as the original estimated cost included the labour-intensive task of dismantling and reassembling the fountain for restoration off-site. This proved to be unnecessary and much of the work was completed on-site. A recirculating pump and in ground collection system was installed to provide a more environmentally sound water system. The six decorative urns among the flower beds surrounding the bandstand were part of a bequest to the City in 1887 by former Chief Justice of Nova Scotia, Sir William Young. 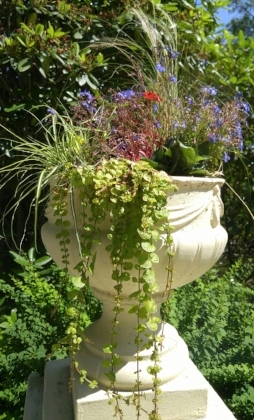 Crafted by Austen & Seeley Stone Works, the urns became unstable and their decorative features eroded. As they were beyond repair, the originals were used as molds for replicas. The replicas were placed in the Gardens in the spring of 2014. The design and construction of the bandstand was commissioned by the City of Halifax in 1887 as a civic memorial to honour Queen Victoria’s Golden Jubilee. Richly ornamented with intricately carved wooden trim painted in vibrant colours, the bandstand’s scale, compact geometric shape, and its role as the focal point of the Gardens’ overall design are all distinguishing qualities that define its heritage significance. Its opening was celebrated with a “grand concert” and fireworks display. The bandstand has continuously served as a venue for public concerts. However, its structure was seriously weakened by water damage from a leaking roof. Successive repairs, the most glaring being the replacement of the original metal roof with one made of bright red fibreglass, had compromised the bandstand’s heritage authenticity. Archival research suggested that the original roof was shaped differently and made of a dull sheet metal. Over time, the metal was painted – first green and then a subdued shade of red. Also, a series of decorative railings on the lower and upper roof and ornate wooden trim had disappeared. In 2011, the bandstand was carefully restored using archival research to replicate paint colours and restore decorative wooden features. The fiberglass roof was replaced with a copper roof in the original shape with decorative metal cresting, a characteristic of important Victorian civic buildings and structures. The Victoria Jubilee Campaign contributed $100,000; the Government of Canada (National Historic Sites & Monuments: Parks Canada) $250,000; and Halifax Regional Municipality $150,000. The splendid restoration was completed in 2011. The official unveiling featured a band concert and fireworks as did the original opening in 1887. Unique Victoria Jubilee tokens commemorating both Queen Victoria’s and Queen Elizabeth II’s Diamond Jubilees were issued to all attending the event. 1. Campaign donations include corporate and personal monetary donations and government grants. The cash equivalent value of in-kind donations of materials and services is excluded. 2. 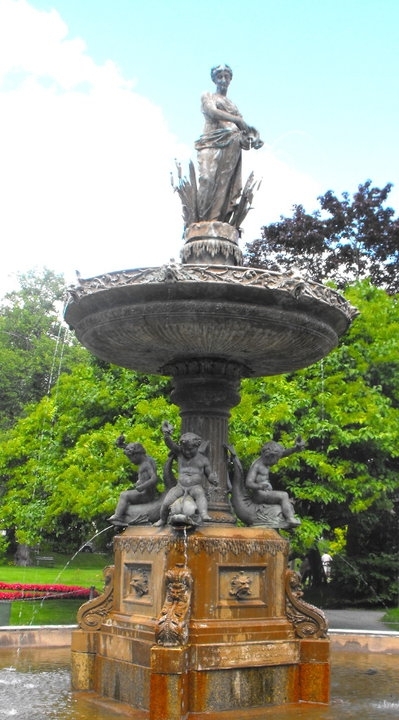 The bequest of Mary Margaret Jarvis specified funds were to be spent on capital improvements within the Halifax Public Gardens to public benefit. 4. Bank interest and unsolicited/unrestricted donations to The Friends of the Public Gardens in 2011 and 2012. 5. Final cost ($463,593.03) below initial estimate of $500,000. Costs include conservation plan (archaeological, historical research, and materials testing of paint, masonry and mortar), architectural and engineering fees, construction, electrical, roof fabrication, and painting. The Friends of the Public Gardens contribution net of HST. 6. The Canada Day Jubilee Bandstand unveiling costs include: fireworks display, musician fees (Maritime Brass), sound system, donor appreciation reception, public event program and refreshments . Assistance provided by Halifax Regional Municipality: Community Festivals & Events Grants Program and HRM Parks & Open Spaces Division. 7. Final cost ($100,770.82) below initial estimate of $375,000. Once dismantled conservators confirmed that the interior metal infrastructure (“armature”) was adequate. Costs include conservation plan, artist fees, foundry work, in-ground water recycling and replacement water pump, and minor landscaping. Assistance provided by Nova Scotia Department of Communities, Culture & Heritage: Community Jobs & Facilities Improvement Program. The Friends of the Public Gardens contribution net of HST. 8. Queen Elizabeth II Diamond Jubilee coincided with the unveiling of the Jubilee Fountain commissioned in 1897 to commemorate Queen Victoria’s Diamond Jubilee. Unveiling of the Jubilee Fountain a feature of Nocturne: Art at Night event. Costs include professional event management, donor appreciation reception, light and sound technical services, audio-visual equipment rental, professional artist fees, custom props and costumes, signage and program translation. Assistance provided by Heritage Canada: 2012 Diamond Jubilee Community Celebrations Program and HRM Parks & Open Spaces Division. 9. Completion expected in 2014. Estimated total cost $38,000 – $42,000. Due to extensive damage the urns had to be reproduced using a mold created from an original. HRM owns the mold and therefore able to replace any future losses with reproductions. 10. Costs include book and medallion to major contributors and permanent donor recognition display. 11. Administration costs of ~4% include stationary, postage, graphic design and printing, Internet fees, Pay Pal commission, and custom commemorative token distributed to the public at Bandstand and Nocturne events. 12. The Friends of the Public Gardens has committed to invest any balance remaining in capital projects within the Halifax Public Gardens and to notify donors/public of same.